Ominous photo, and I doubly Iove your description of how it happened and your imaginings about belfry bats being held by stony buttress arms. I’m so glad to have you “back” writing and photographing, Mary. Cheers. Thank you, Leigh, for sticking with me, and for your always kind words. 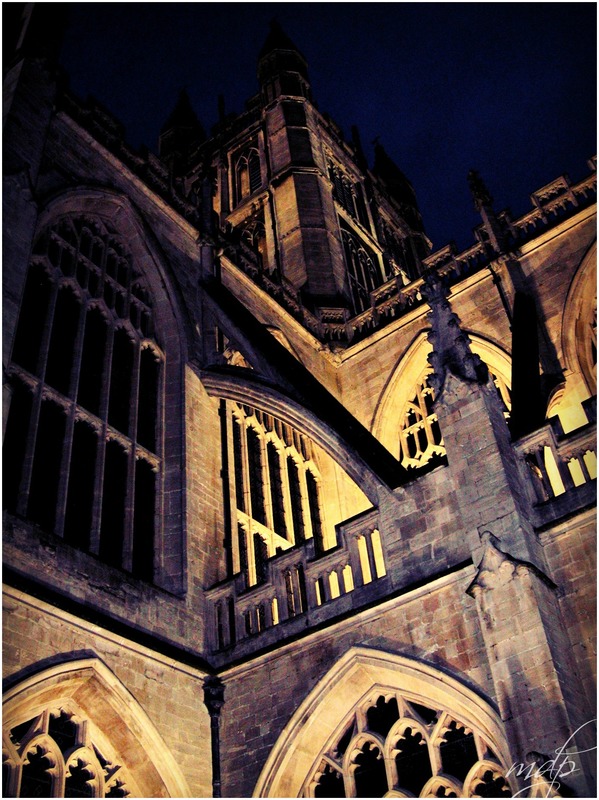 Bats are such a thing with me, as is gothic architecture, which lends itself to visions of bats, don’t you think? Thanks for stopping by and saying so, Shelly. Yeah! BATS. They eat their weight in mosquitoes every night. So we like them. I think. Great photo. I actually bought a bat house years ago and had my husband put it in a tree in the hopes that bats would come and eat our mosquitoes. Not one bat has ever put wing to that house. I recently read a comment threat somewhere about bat houses and someone pointed out that the house needs to be rather high, because, of course bats like to hang in high places. Makes perfect sense! I have recurring dreams about bats, so evidently I haven’t “released” them. I don’t mind bats in the real world, but the ones in my dreams are not so nice. Wow! What an amazing shot, Mary! Great shot, but I admit I was looking for the bats…. Oh, they’re there. Sneeky little blighters. Great shot, Mary! Aren’t those night time tours wonderful? They bring out a whole different set of stories! Thanks, Laurie. They do. I’d like to go back and do the Bath tour again. There’s something about exploring an old city like that at night with all that old architecture. Plus, when this photo was taken, our son was 16 and the tour ended at a pub, which we really wanted to enjoy, but we were asked to leave because of our son and his age and the time of evening. Evidently, in England there are variations in the liquor licenses depending on time of day. Our son is now 25 so we’re all set for any variation. And the three of us are headed back to England next May, so you never know. lovely photo Mary… and a great tour with a magic trick, then the bats… oh how eeery. I always marveled how the old cathedrals were balanced from the outside… that’;s why they were so narrow.. have a great week! Oh, Clay, you would have loved the magic trick the guy did by the cathedral. It was amazing — tieing a woman’s ring to a baloon and setting it off into the air … which is why I was looking upward in the first place. As for the cathedrals, the flying buttresses allowed for those magnificent tall windows that let all the heavenly light light into the place. Gorgeous shot! It conjures all sorts of interesting horror romance stories in my head. One of these days I may need to come back to look again so that the story makes it to paper. Thank you, Kitt. I do love a good horror romance story. Makes me think of Wuthering Heights. Come back and look to your heart’s content. Thanks, John. I’m always happy when I can provide a chukle. Nice shot. It’s been twenty years since I visited the UK- Bath was a stop. Charming little town, excepting for the American fast food joints. That was one of the first things we noticed wandering around — all those narrow, cobbled streets and centuries old buildings and then a Subway shop. I’ll take the bats any day. I miss seeing your photos, Mary…makes me want to grab my camera, too.